"Clear bright illustrations show all the cars of a train bringing the reader the excitement of movement through day and night, country and city."--Booklist. A fun book for really young children (3 or under). Very simple, no real plot but lots of fun sound effects you can make and very colorful illustrations of the train. can be used as a way of color recognition. even the younger children seemed bored of this one fairly quickly. 2.5 stars. 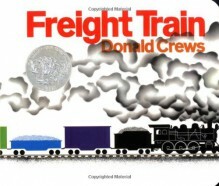 Simple illustrations of a freight train with different color cars (each is named).